The highly knowledgeable and helpful team of RV experts at TerryTown RV are ready to help you bring home your dream RV! As one of the top RV dealers of Michigan, you'll be able to browse through a wide variety of stunning RV models! You'll have a blast in this 2019 Highland Ridge Mesa Ridge MF371MBH, an outstanding 5th Wheel! See this RV for yourself at 7145 Division Ave S Grand Rapids Michigan 49548, or call us at 616-455-5590 to learn more! Get on the road anytime you wish in your 2019 Highland Ridge Mesa Ridge! It's easy to tow with its hitch weight of 2515 lbs. This RV has a GVWR of 16470 lbs. and the patio awning is 19' 0" long, providing shade and protection during your outdoor living! One of the things you'll love about the 2019 Highland Ridge Mesa Ridge is that it sleeps 8 people in real comfort! You'll especially enjoy the spacious Queen bed in the master bedroom! Nothing like snuggling down into a warm, rejuvenating night's sleep after a full day of RV outdoor fun! Stir up a nice meal for the family in the kitchen! Inside there is a 3 burner range cooktop and a 8.00 cu. ft. refrigerator. The 85 gallon fresh water tank provides enough clean water for the entirety of the trip! 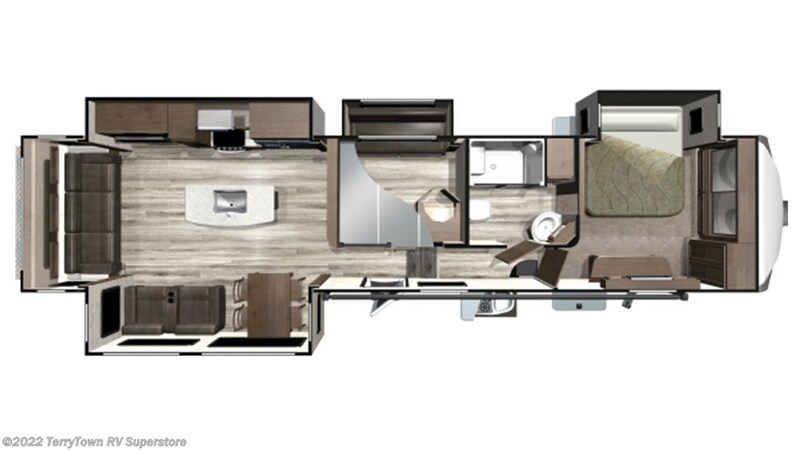 andnbsp;This RV is designed for big family comfort, especially at night, because it sleeps up to 8 people in 3 beds, including the cozy bunkhouse with its comfy Flip-Up Bunk!andnbsp;The outdoor kitchen is a great amenity for anyone who loves hot meals and cold drinks out in the sunshine, AKA everybody! Check out Stock # 36320 - 2019 Highland Ridge Mesa Ridge MF371MBH on highlandridgesource.com!